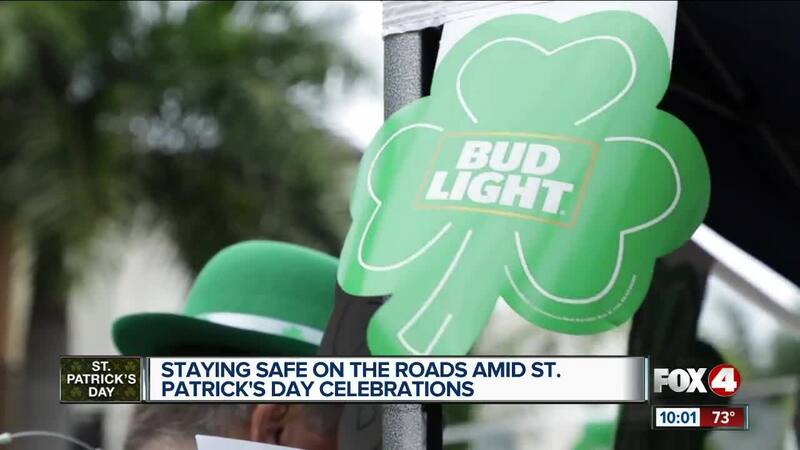 FORT MYERS, Fla. — Don’t bank on luck to get you home safely on St. Patrick’s Day. The Cape Coral Police Department warns drivers to watch out for sure signs of impaired drivers. “Failing to maintain a single lane, driving well below the posted speed limit, driving without headlights at night, swerving, weaving, driving on the sidewalk,” said Allan Kolak, master sergeant at Cape Coral Police Department. Holidays like St. Patrick’s Day usually mean a lot of drinking alcohol, but visitors like Don Schroeder thought ahead and took an Uber to downtown Fort Myers. “A lot safer… don’t wanna get a D.U.I.,” Schroeder said. Even a small consumption of alcohol can result in a fine. “You can actually be arrested and charged at a .05 and above,” Kolak said. Kolak recommends planning before going out on holidays. “There’s a lot of money that goes along with a first offense DUI, so the best decision is to spend that 20, 30, 40 dollars for alternate transportation instead of almost 12,000 later on,” Kolak said. Some companies offer free rides on holidays, like AAA Tow to Go or the River District Trolley in downtown Fort Myers. Other services include The Nickel Ride , Uber, and Lyft.